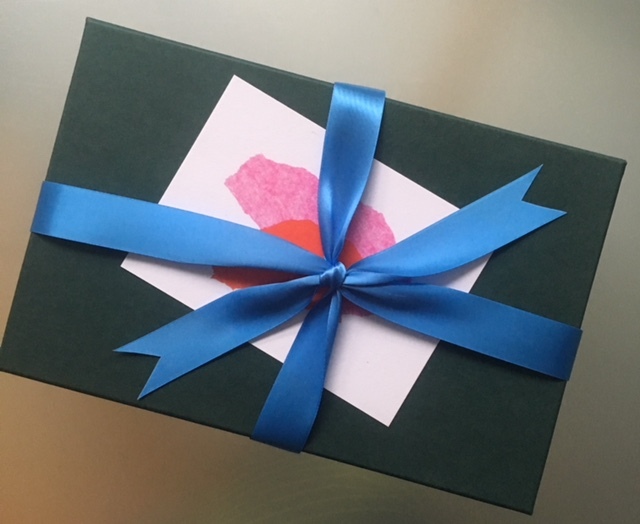 Sometimes out of something terribly testing comes out a seed of hope that blossoms into a giving tree – that’s really the first thing that came to mind, when I received a gift box from the Boost Box Company. Its founder, Nadia Campbell, initially comes across as any other busy mother of three daughters, balancing work & family, but dig deeper and a treasure of wisdom comes to the surface, teaching anyone willing to listen that life doesn’t give us tasks that we can’t deal with, but it is the way that we respond to challenges that is the making (or breaking) of us. Nadia and I ‘met’ via social media pages. We exchanged e-mails, which led to a long phone conversation on March 8th, International Women’s Day, on a variety of subject. Her story touched me deeply & having had my own personal crisises in the past, I know that we share multiple common threads. The idea for the business was inspired by my eldest daughter’s cancer diagnosis, prognosis and treatment and the holistic approach we took to her health and wellbeing, which we believe inspired her recovery. After our talk, Nadia assembled a generous & surprising box for me and when it arrived, just opening the exterior packaging, felt like a gift in itself ( even the Royal Mail label on it said ‘deliver with care’, eliciting a smile from yours truly). Picture an emerald green box tied with blue ribbon and a strikingly eye-catching card tucked under it. Lift the lid, inhale the aroma & uncover the goodies, surprising & delightful, one by one. A pack of warming tea, a skin balm, an eye mask, a de-stress roller ball, a jar candle with a screw-on lid, a chocolate bar, a bag of bath salts. Examining each item brought a feeling of childish delight. Someone assembling something special for you – to nurture, to delight, to show the care, that sometimes we all lack in the middle of a crowded space called Planet Earth. Putting each item to good use felt like a mini-ritual that made me feel particularly grateful for the moments of mediative calm or peaceful pleasure, depending on the product. Each time I used or use one of the products that Nadia enclosed for me, I think of a woman who tirelessly and lovingly does this every time an order gets placed for someone who is battling cancer or needs an energetic lift, because life isn’t always like a bunch of roses – happily, beautifully fragrant. All of us see the sad, hard, raw, exhausting, downside side of life, some more than others. So it’s nice to be reminded that life and people are good, no matter the turmoil that you or someone else you care about is going through in the moment in time. Nadia is private by nature & only uses social media for promoting or highlighting her business, yet she didn’t shy away from sharing what inspired her business in the first place, when asked. A few years ago Bibi, Nadia’s eldest daughter, became unwell and what initially was thought of as a cold or flu, turned into a cancer diagnosis. I can’t imagine what a parent must feel when the rug is pulled from under them, when their child becomes sick. We as parents hold responsibility for our children from the moment they enter the world. To delegate this responsibility to complete strangers, even though they are doctors and you simply can’t shy away from that step, is not easy. On top of that, you can’t crumble or show fear of the unknown or allow yourself to be weak – you need to pull yourself together and fight like a lioness, which is what Nadia, alongside her husband, did, while also looking after their two younger daughters. While doctors got on with their job, Nadia focussed on hers, making sure every day brought comfort and some kind of joy for Bibi. Whether it came in the form of a comfortable blanket for the hospital, painting Bibi’s nails or just sitting on a bench in the park, looking around, talking, smelling the fresh air – anything would do to lift the spirits and help kick the disease away. The word cancer carries dreadful negativity in itself and this is one of the things that inspired Nadia to start her business, The Boost Box Company, when Bibi made a full recovery. A box that will allow you to be catapulted from a gloomy place to a brighter, more positive one. Nadia and I share the belief that out of bad things, come up the good ones, you just need to look for the positives, no matter how small, at the time when you are in a dark place – be it because of the disease, personal or work issues. We all need to be reminded of beauty and comfort at the time when life seems like a deep and dark rabbit underground den. You also need to ask questions & not be compliant, because if we don’t push back & don’t look at the alternatives, we can’t win and sometimes loosing isn’t an option. Ultimately you always need to do your best, no matter what are the circumstances and final outcome, because only then you will be able to look at your own reflection in the mirror. Life is the best teacher, however we look at it! It helps though to have a supportive tribe around you, who act as fuel for your emotional reserves. At the time when many would rather receive, then give, pause & think about how it makes you feel when you give someone something – a smile, a peace of advice, a helping hand, a hug, a gift. A relative or friend doesn’t have to be ill for you to take the time to spend time with them or to get them something that might make their day. Choosing a thoughtful gift for someone you care about or someone who needs some cheering up is fairly straight forward. You can send them a specific box Boost Box (there are currently 16 to choose from The Night Time Boost Box, The Activity Boost of the Good Morning Box for him or her), or create one of your own via Nadia’s hands, bearing in mind things that they like or things that might make them smile. My personal Boost Box contained delicious Joe’s Tea Co St. Clement’s Lemon Tea, that cheered me up as I typed yet another post, fuelled also by Pana Chocolate Coconut & Goji bar. I have seen both brands on natural retailers shelves, but never got down to trying them, so Nadia acted as a ‘foodie godmother’. The ‘no dairy’ bar was a particular surprise, both in terms of taste & texture and since then I tried other flavours of Pana, but this one tops the list so far. Nathalie Bond Organics is a lovely British brand and its Extra Sensitive Skin Balm was a perfect choice for the skin ravaged by the un-spring like weather we have experienced in the last few weeks. Blending Apricot Kernel & Jojoba Seed organic oils with Beeswax and Shea Butter, the balm is made in small batches, is gentle on the skin and is unscented. I happily applied it to my hands, face, lips and did the same with my kids. Tisserand Se-Stress Aromatherapy Roller Ball was formulated to lit your spirits thanks to the blend of zesty Orange, floral Rose & Geranium & warming Nutmeg essential oils. It comes handy both at home, as well as when you are travelling on public transport or even during the moments of tense concentration at work. Just gently roll it over your pulse points – temples, behind ears, nape of neck, shoulders, wrists, legs or feet, taking the time to focus on your breathing, making it lengthier when it comes to both inhales and exhales and see if you feel different in five or so minutes. Interstellar Relaxation Space Mask comes in a little plastic sealed pouch & contains a self-heating eye mask, which will relieve tiredness & eye strain. The mask (which contains just two ingredients, the essence of jasmine & iron powder) starts warming up as soon as you open it, so make sure you are fully reclined on the bed, chair or in the bath & are ready to receive some nurture at the end of a particularly testing day. Follow it up with a Eucalyptus Rosemary Organic Bath Salts from made by Coopers Apothecary, which soothes the frayed nerves, as well as pain & relieving aches after a gruelling workout or non-stop day on your feet. Deeper breaths will enhance the peaceful vibes that in turn will help you have a good night’s sleep. And we all know from experience that a good night’s sleep allows us to have a more positive outlook in the morning. Last, but not least, the magic of candle light, thanks to the Seven Seventeen ‘Hello Calm’ Moroccan Calm. Made from natural plant-based wax & hand poured into a jar to ensure even fragrance distribution, within minutes of lighting it up, it fills the room with a delicate scent of roses in bloom, enveloping your senses and mind & creating a tranquil environment. Something we all cherish at the end of a busy day! And when it comes to this particular candle brand, what also endeared it to me is that £1 is donated from each sale of the candle to PANDAS, a charity supporting mothers suffering from pre and postnatal mental illness. Nadia also has a separate page on her website, with a list of cancer charities and links to their website, which might be helpful for those people, who are placing the order for someone already battling cancer. Each product on The Boost Box Company’s website is chosen with thought & knowledge by Nadia, each safe & nurturing, some supporting a charitable cause by way of donating part of the product proceeds to a charitable cause – that type of business that makes everyone feel good because it is kind, thoughtful, uplifting things that at times are taken for granted, yet so much appreciated & needed in the current flux our world is in. Watching news is depressing, weather is often too, so how about starting a wave of change through your own actions? By being kinder & consciously choosing to support businesses and brands (at a very testing time for retailers as well!) that are as much about spreading joy & benefitting to consumers, as they are about being successful long-term, we actually help make the world a brighter, better, more ethical & positive place. To find out more about The Boost Box Company or to place an order, please click here (this is NOT an affiliated link).